Board Index > General Chat > Anything Goes > What is your favorite concert/band memorabilia? 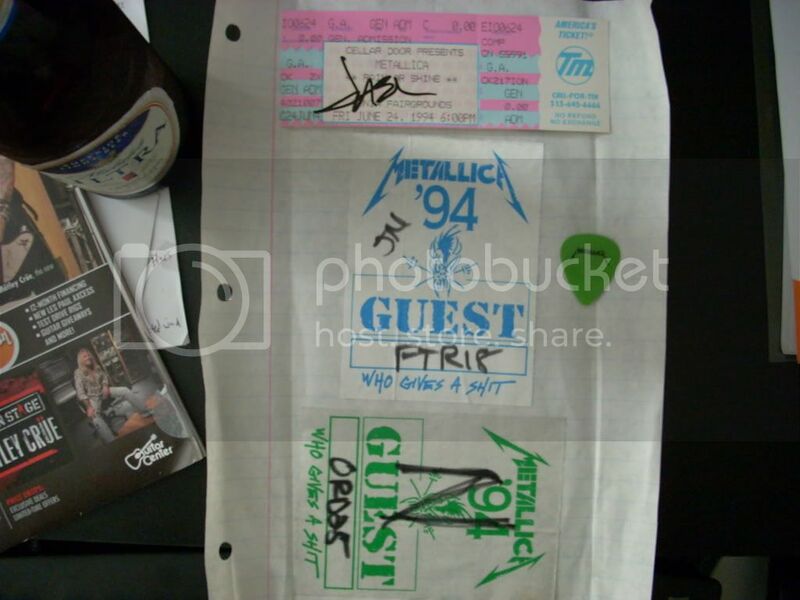 Author: Subject: What is your favorite concert/band memorabilia? Please post a story or picture of your concert memories or just favorite band merchandise. I was cleaning out a closet and finally found this stuff from 15 years ago when I was 18. What a great time in my life. I even found a goofy picture with my girlfriend at the time taken with Mr. Newsted. Ahh those were the days. My Waiting For Columbus LP by Little Feat signed by the entire band including Lowell George in 1976. It was the first concert I was ever backstage, and got to party with the band afterwards at the hotel. The openers were Boz Scaggs [Not a very pleasant dude in the 70's] and The Cate Brothers who were very cool. Lowell was a very funny guy. Kept us all laughing. I have collected quite a few backstage passes and press photos. Mostly ABB passes. I had them all hung on the wall until we remodeled the inside of our home. I have an original Grateful Dead concert poster from their show at Spartan Stadium, San Jose on April 22, 1979. Randy Tuten the artist autographed it. I have never seen it on Ebay no matter how many times I check. I suppose it is so rare that there aren't enough people that have it to sell. The Dead performed on that day as well as The Charlie Daniels Band and the Greg Kihn Band. Brent Mydland made his concert debut on keyboards. One of my favorite live Dead shows too. That's quite a ticket! I would love to see that live one! Well, sadly my brothers and I never hung onto all the Fillmore East booklets we had. Those Fillmore East programs are awesome. They contained artist information, upcoming show information and advertisements for the latest and upcoming LPs, radio stations, hippie shops and local events. There are always Ebay auctions for these but they are usually quite pricey. Never was much into collecting other than ticket stubs, but I do have some stuff and this year was a good one for adding to what we have. We have our backstage passes from that show, backstage passes from ABB at Canandaigua, and Derek got Henry Paul's set list from the Outlaws show in Syracuse. I've got numerous guitar picks, some I've gotten at shows, some that were sent to me. I have a Dokken platinum LP award on my wall bought at a charity auction. Probably my favorite though is a ZZ Top keychain from the Eliminator tour. Billy Gibbons tossed one into the audience every show and the night we had front row seats it landed at my (then) wife's feet. I used it for my RX-7 key. Here I need to shout out to Hughduty, who has sent my son Derek some very nice Eagles memorabilia, including a Hotel California concert program and a very nice framed and matted band picture. He also sent me his personal 200 Motels poster to replace a cutout casualty one that I had. Mine and my wife's are both "new" memorablia.....my fav is the photos I took this summer of Derek and Susan from the front row at the Soul Stew show we went to...the wife's has to be the guitar pick she got at the Cheap Trick concert we went to 2 weeks ago...not rare, but very special to her. Sure, neither is as cool as some of the old stuff you people have, but they bring back good memories. Grateful Dead shows at MSG. When the Dead came to the NYC It was great!! They even had a King Kong outside wearing a tye-dye! Having a B-day in Sept. It was always nice seeing them there in the fall during that time!!! 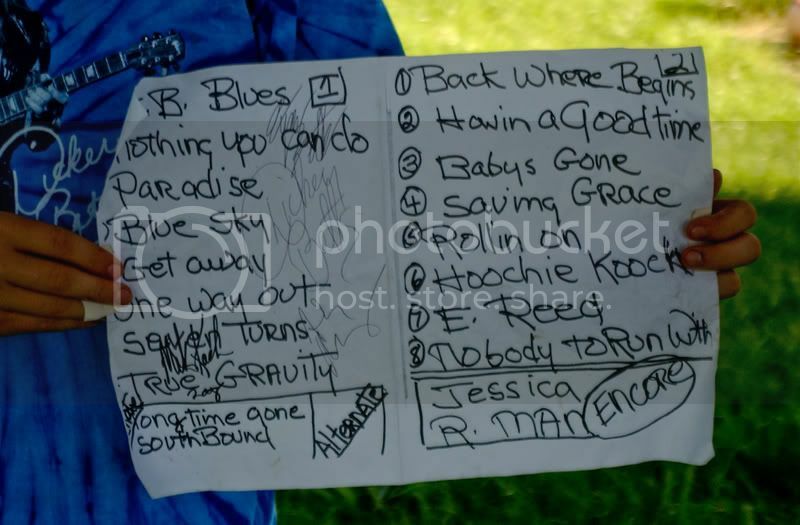 A Derek Trucks poster from the 2004 Soul Serenade tour. It is a signed print marked number 192/200. I bought it at the show at the Fillmore West in San Francisco. Might be my favorite. Eric Clapton poster from the 2004 tour, the "Me & Mister Johnson" tour. It has all the cities listed on the world tour, and the San Jose show I attended was the next to the last, as they ended the tour the next night in L.A. Pretty cool poster. Fats Domino poster I got at what may very well be his last live performance, at Tipitina's in New Orleans last year. It looks like the old style posters, and brings back such wonderful memories every time I look at it, that it might be my favorite, too. 2004 Gabbafest poster, signed and numbered 19/25 by the artist, our very own Denise Halbe. It's a beautiful poster, and also brings back great memories of that weekend at the Fox, and the Georgian Terrace Hotel. I keep tickets and other stuff, but probably the most unique piece of memorabilia I have is actually a copy, made on a regular copier. The guy who has the original asked his wife ot make me a copy, and that is what I got. It is a promo photo for The Escorts, the Daytona Beach band that Duane and Gregg played in. 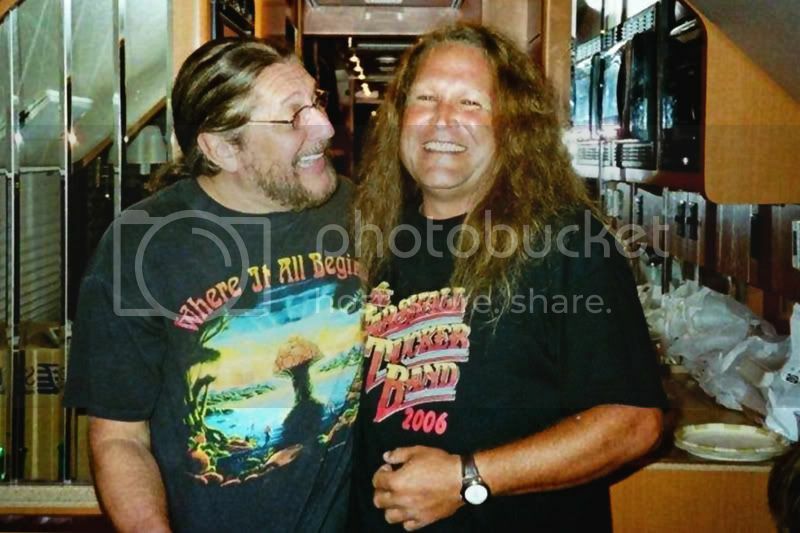 My friend was a friend of Van Harrison, the bass player. He sat in himself a few times on bass when Van couldn't make it. Duane and Gregg both have short hair, and are wearing suits I can only describe as Beatle suits. Both are holding guitars, Duane a Gibson ES 335, I believe, and Gregg a Strat. I'll try to post a photo of it sometime, as I don't think it has ever been posted here. Can't compare with some of the previous stuff, but had front row center for the ABB at the Oakdale Theatre a few years back and Butch gave me a drumstick. Had 2nd row for BB King and a guitar pick landed at my feet. I didn't see where it came from, but picked it up slipped it in my pocket. My ex starts yelling at me that BB had flipped it to a kid in front of me but the kid missed. BB saw the whole thing, gave me kind of a fake frown/smile/head shake and flipped the kid another pick. 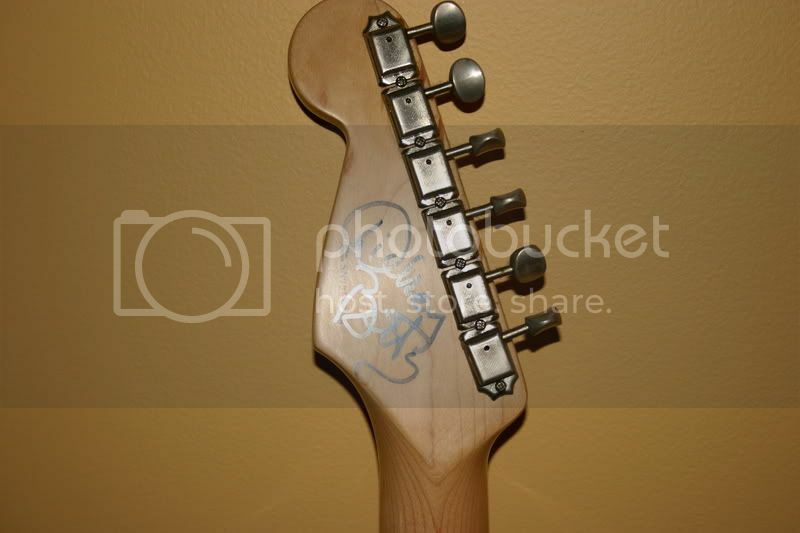 My brother and I purchased Derek's autographed Washburn guitar a few years back. I believe it was the first custom guitar Washburn made for him, but I may be wrong. It is the guitar that they auctioned off for Woody's. Beautiful instrument. Other than that it is concert posters and albums. I love the 2003 Beacon poster I have professionally matted and framed, signed by Warren after the show. And I was at the 100th Beacon concert in 2001, had Derek sign that ticket. Great show, Chuck played a few tunes. Mulehead1 what a great story about Waiting for Columbus. Had to be an amazing night! That's hilarious. Kids need to learn disappointment anyway right? Good thing he gave the kid another one though, you might have learned about pain or threats!!! That's kind of where I'm coming from too. That pick I have is the only one I have gotten from a show. Kind of like wanting to catch a fly ball when you were a kid and actually getting one. I also love my Peach t-shirt from last years ABB show up north! I was wondering what was better than this shirt.